Edited on Wednesday 20 March 2019. My email address is eric at hulteen dot com. The rest of the Hulteens can be found at Hulteen.COM. The photograph to the right is from 2013. My professional field is human-computer interaction design (a.k.a., user experience design). I'm not a technologist particularly, although I like technology; fundamentally, I'm a designer. Currently, I'm a User Experience Design Lead at Salesforce in San Francisco. I arrived at Salesforce through their acquisition of griddable.io where I was a senior staff interaction designer. Through September 2017, I worked for VMware in the user experience design group on the vSphere application, the "operating system" that allows you to manage datacenter virtual computing environments. From 2005 to 2009 I worked for Seagate Technology doing user interface design. You might ask what user interface there is for disk drives, but I didn't work on disk drives—I worked on the software that comes with the retail, branded products that Seagate sells (e.g., external disk drives, NAS drives, and web services). Prior to that I worked for Mirra, Inc., a startup that sold a personal server for your local network. This server continuously backed up folders you specified (from any computer on your network) and allowed you to share those folders with other people on your network or the web. In September of 2005 Mirra was acquired by Seagate. In 2000 I formed Aryk Web Design with Kyra Rice in order to apply my professional skills and interests to designing people's interactive experience on the web. Aryk Web Design was dedicated to a simple idea — that web sites and computer applications should be focused on providing a satisfying, productive, and (dare we say) even pleasant experience for people. Aryk Web Design was dissolved in 2002. Prior to 2000 I did research in human-computer interaction at several labs. Much of that research has been on conversational interaction between people and computers; making computers capable of having spoken conversations with people. Beginning in 1998 I worked as a Member of the Research Staff at Interval Research Corp. Interval was disbanded by its owner, Paul Allen, in April of 2000. From 1985 to 1997 I worked at Apple in the Advanced Technology Group (ATG); most of that time in the Human Interface Group. Eventually I ended up in the Intelligent Systems Program in ATG until September of 1997 when Apple (in the form of Steve Jobs upon his return to Apple) terminated the entire Advanced Technology Group. It said on my Apple business card that I was a Spoken-Language Interaction Designer. I had another Apple business card that said "Director, Off-Planet Operations." So much for business cards. Prior to Apple I worked at Hewlett-Packard Labs in Palo Alto, California and at Atari, Inc. in the Systems Research Lab in Sunnyvale, California. I'll write more about those experiences at some point. My undergraduate degree at MIT was in architectural design. My Master's degree, also at MIT, was in human-computer interaction. I did my human-computer interaction research in a lab with the interesting name of the Architecture Machine Group — now it's called the MIT Media Lab. At the Architecture Machine I worked on a number of projects, some of which were documented in videotapes (listed below) that have been digitized and posted on the web. The first three of these projects I co-designed and co-implemented with Chris Schmandt. On the last project I designed and implemented only the speech interface shown in the middle of the videotape. S.E. Brennan and E.A. Hulteen. In Knowledge-Based Systems. March, 1995. pp. 143 - 151. "VoiceNotes: A Speech Interface for a Hand-Held Voice Notetaker." L.J. Stifelman, B. Arons, C. Schmandt and E.A. Hulteen. In Proceedings of INTERCHI '93 (ACM SIGCHI '93). pp. 179 - 186. "User-Centered Design and Voice-Interactive Applications." In Proceedings of AVIOS (American Voice I/O Society), 1991, pp. 4 - 8. "Integrating Speech into the User Interface." In Proceedings of AVIOS, 1990, pp. 41 - 45. G. Kurtenbach and E.A. Hulteen. In Laurel, Brenda, Ed., The Art of Human-Computer Interface Design. Reading, Mass. : Addison-Wesley Publishing Co., May 1990. In Whitney, Patrick, Ed., Design in the Information Environment. New York: Alfred A. Knopf, Inc., 1985, pp. 56 - 65. C. M. Schmandt and E. A. Hulteen. In Proceedings of the Conference on Human Factors in Computing Systems. March 16 - 17, 1982, Gaithersburg, MD. New York: ACM, 1982, pp. 363 - 366. Water is a whole world for me — a world in which I spend a fair amount of time, in one way or another. This section about water outgrew this page so, as of September 1998, you can visit A Personal Discourse on Water and its Meaning to Me. The control of motion is one of the things that I enjoy about water, and that interest is reflected in the pleasure I take from driving. Driving is an exercise in dynamic flow control; making decisions quickly that take into account the relative velocities and probable trajectories of all the vehicles with respect to each other and to the terrain. It's about fluid motion. I enjoy both driving and seeing new places in the world, and particularly the transitions from place to place. I've driven back and forth across the United States four or five times. 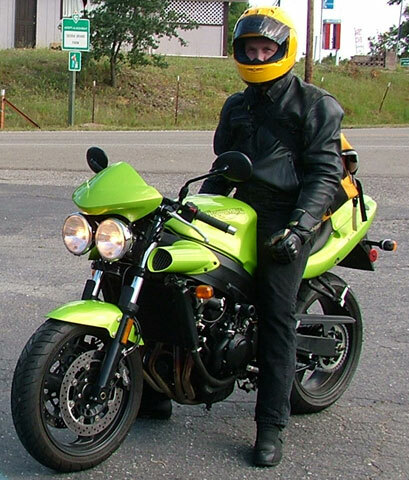 In the spring of 2002 I bought a motorcycle — a Triumph Speed Four. That's me in the picture to the right. I've started a separate web page for other pictures of Eric's Triumph Speed Four. Since 2001 I've enjoyed hiking in Death Valley National Park every year, most recently in March 2018. There are pictures and descriptions on Hiking in Death Valley. I've been visiting Mendocino, California for many years. In May of 2008 I went to Italy, to Florence for the SIGCHI 2008 conference and then on to Venice. The web page is called Italy 2008: Florence and Venice. In November of 2007 I went to Portugal. I stayed mostly in Lisbon and visited Evora, Porto, and Salamanca, Spain. For pictures see Portugal 2007. In May of 2006 I went to Europe for the first time. I stayed mostly in Paris, but also took a four-day road-trip to the south of France. For pictures and commentary see France 2006: Modern Architecture and Medieval Villages. In August of 2001 I drove from California up through Oregon, Washington, and Idaho visiting dams, landscape art in Spokane, and climbing South Sister in central Oregon. For pictures and commentary see Oregon, Washington, and Idaho: Dams & Climbing. In February of 2001 I flew to Anchorage, Alaska to visit my brother Kurt and his wife Linda. I've posted some Pictures of Eric's February 2001 Trip to Alaska. In May of 2000 I went on a 5-day back-country camping and landscape art-making trip as part of a class I was taking at the Continuing Studies Program at Stanford University. The class was titled, "From Mono Lake to Death Valley: An Artistic Exploration of Water from Ice Age to Arid Desert". I was very interested in this because it simultaneously involved water, desert, and art. After the trip I helped design and build a web site about the art work that was done on the trip: From Mono Lake to Death Valley. In May of 1998 I flew to Anchorage, Alaska and drove from Eagle River to Deadhorse (at Prudhoe Bay on the Arctic Ocean) and back again on the Alaska Pipeline "haul road." See Driving the "Haul Road" to Deadhorse, Alaska. In October 1997 I made a 7,224 mile drive from Menlo Park, California to Eagle River, Alaska and back. The story and pictures from that trip are titled Eric's Drive from California to Alaska. 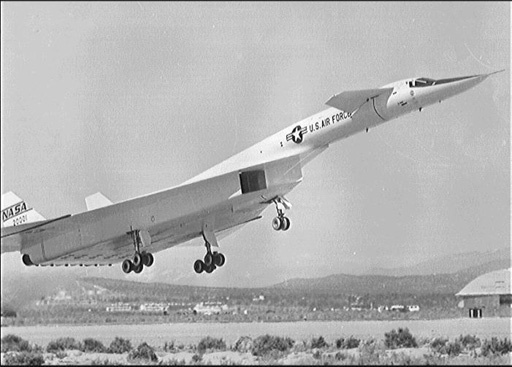 I'm fascinated by an experimental airplane from the 1960s, the XB-70 "Valkyrie" built by North American Aviation. It was originally designed as a high-altitude bomber for the Air Force that could fly three times the speed of sound (faster than a bullet) at 70,000 feet. When the bomber program was cancelled NASA took over the two planes to do research on high speed, high altitude flight and aerodynamic and thermal loads. Only two XB-70s were built, at a cost that exceeded the value of their weight in gold. One of these, tail number 20207, crashed on June 8, 1966 and the other, tail number 20001, was retired to the National Museum of the United States Air Force in Dayton, Ohio on February 4, 1969. The XB-70 had its horizontal stabilizers forward of the wings and the wing tips folded down so that it could gain lift by surfing on its own supersonic shockwave (a phenomenon known as "compression lift"); it was the original, real "shockwave rider". Visit the NASA XB-70A Valkyrie Photo Collection. I design and build furniture and water fountains . I've lived in California since 1982 but I was born in Boston and grew up in one of its southeastern suburbs, a town named Weymouth . I graduated from Weymouth South High School in 1971. Someday I'd like to live in the deserts of the American southwest as well as on the north coast of California (Mendocino or Sea Ranch). In the early 1990's I visited Australia. I liked it a great deal. I visited the cities of Sydney, Melbourne, Adelaide, and Canberra (where I visited several dams). Someday I'd like to go back for an extended visit; maybe live there. Occasionally, I have a thought (or a mental paroxysm or a rant) that I want to get out of my system. This page, titled Thoughts is a blog-like page that I created to contain those short opinions that I wanted to share with anyone that cared to read them. This is an interesting piece of software — it generates falling raindrops on any image. Watch it for a few minutes (give it time to fill the image with raindrops); the drops of water are optically correct (spherical and inverted) and they collect and leave trails properly as they fall. If you reload the web page it will start over with a new image. You can download the software as a screen-saver and have it use your own images. Many web site, particularly news/newspaper sites, require that you create an account before they will allow you to access their site. BugMeNot is a site that allows you to bypass these compulsory web registrations. Enter the URL for the site you want to enter and BugMeNot will give you a username and password that is already registered. There are a seemingly endless supply of myths, hoaxes, threats, chain letters, and other Internet junk mail. Before you forward another warning of a bizarre threat to "life as we know it" please try to determine whether a hundred million people haven't already been warned about it erroneously. This is a list of places to start. There is an Apple Alumni Association which describes itself as "... dedicated to helping current and past members of the Apple family keep in touch with each other, share information on where job opportunities are, and any other news relevant to the community." There is a web site for Apple Human Interface Alumni developed and maintained by Tom Erickson. The page provides pointers to alumni of the Apple HI community. I've compiled a list of all the people that worked in the Human Interface Group at Apple Computer, Inc. during the 8 years that it existed (1985 to 1993) and posted a page with that information along with some pictures of the group.